Leading up to this year's Dragon Boat Festival, the people of West Bengal got a taste of Chinese dancing, music and acrobatics at the China-India Cultural Exchange Performance on June 11, held at GD Birla Sabhaghar, Kolkata. The event was organized to reinvigorate India-China friendship by the Consulate General of the People's Republic of China, in association with the Rakshak Foundation, Kolkata Police and the Cultural Affairs Department of Yunnan province, China. The Dragon Boat Festival Gala audience of more than 1,000 included local art and culture lovers, students and teachers from local schools and universities, members of the overseas Chinese community and local Chinese enterprises, plus Chinese consulate staff. The event featured a variety of dance, acrobatics, and musical performances. In his opening speech, Consul General Ma Zhanwu said that the Dragon Boat Festival, celebrated in China and many of its neighboring countries, is a traditional Chinese holiday on which people express their love for their home country and their hopes for a good future. Ma went on to stress the importance of cultural exchange between China and India. He said the people of the two nations share many common interests, one of which is a love for music, literature and film. "Cultural exchanges between China and India have huge potential and this cultural potential should be tapped to further develop the shared understanding, friendship and mutually beneficial cooperation between these two great nations," he said. Ma noted that the joint artistic performances were being held against a backdrop of improving favorable relations between China and India. The evening was filled with distinctive performances by artists from China and India who showcased folk dance, folk music and other cultural shows from both countries. The show kicked off with a Han ethnic group dance called "Blooming Camellia," which enthralled the audience. A team of 18 artists from Yunnan Culture and Art Troupe of China further entertained the people of Bengal with performances including the Jujitsu acrobatic routine "Swallow Chick Opens its Mouth," the hulusi (cucurbit reed flute) musical number "Fern Leaf Hedge Bamboo in the Moonlight and Wedding Vows," the Dai ethnic dance duet "Painted Umbrella & Elegant Orchid," the Yi ethnicity solo dance "Her Blushing Face," the kongzhu (Chinese yo-yo) routine "At the Dragon Gate," the dance number "Beautiful Huayao Dai Girls," and the Yi ethnic group dance "Ringing Horse Bells and Singing Jade Birds." On the Indian side, the headlining numbers were performed by Sujay Chanda and the Indian living legend vocalist Usha Uthup. The former is also joint commissioner of the Kolkata Police. Usha Uthup conquered the hearts of the audience with her rendition of "Kolkata Kolkata," a song celebrating the City of Joy. Sujay Chanda also sang Bengali folk songs, Rabindra Sangeet (Rabindranath Tagore's songs) and other popular songs in Hindi and Bengali. 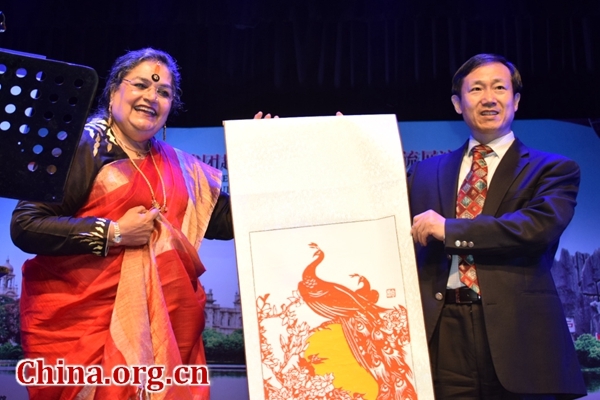 During the show, Ma Zhanwu presented a traditional Chinese painting to Usha Uthup. Following the cultural performances, Consul General Ma and staff members of the consulate presented bouquets to the artists and thanked them for their excellent performance. Many audience members also flocked to the stage to express their admiration for the Chinese artists and to thank the Chinese Consulate for bringing the Chinese artistic performances to West Bengal. These cultural expressions will surely serve as an excellent foundation for further expanding exchange and enhancing understanding between India and China. In honor of India-China friendship and in celebration of the Dragon Boat Festival, a joint stage show featuring cultural performances from both countries was held in Kolkata, West Bengal, India on June 11.